In 1982, I made my First Box. It was 1 1/2 inches high and made of walnut. 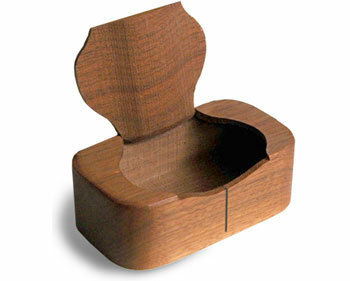 Self-taught in woodworking, we sold our little boxes in Los Angeles street craft fairs. 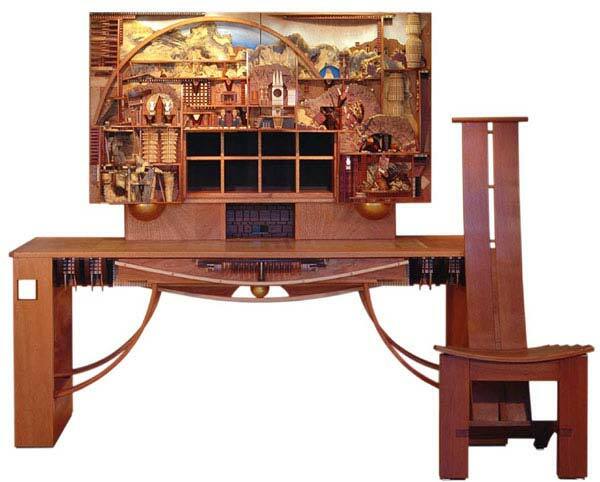 ::My latest work, completed in 2004, is a writing desk for those who may have writer's block. It aims to inspire. Desk length: 73", height: 71", depth: 27", table height 29 1/2", chair height 49", chair width 21", chair depth 23". ::In 2003 I visited Perth on the coast of western Australia. Some local artists kindly gave me woods from the region. These beautiful timbers have been incorporated into the front doors of the desk. The Australian woods included are: peppermint, blackbutt, she-oak, jarra, marri-curly and river banksia. ::Other woods used are: Pau amarillo, Hawaiaan koa, honduras, mahogany, wenge, purple heart, palm, buckeye burl, cherry, maple, ebony, pink ivory wood, cocobolo, stained plywood, holly, permambuco, zebrawood, tulipwood, narra, pine and bamboo.